The Fire Island School District believes in a collaborative approach to instruction that is designed to meet the individual needs of the students. Our mission is to create a safe, supportive, student-centered environment. We are committed to helping all children achieve academic excellence through creative challenges within our unique island setting. Our goal is to prepare the students to be dynamic citizens of our ever-changing society. 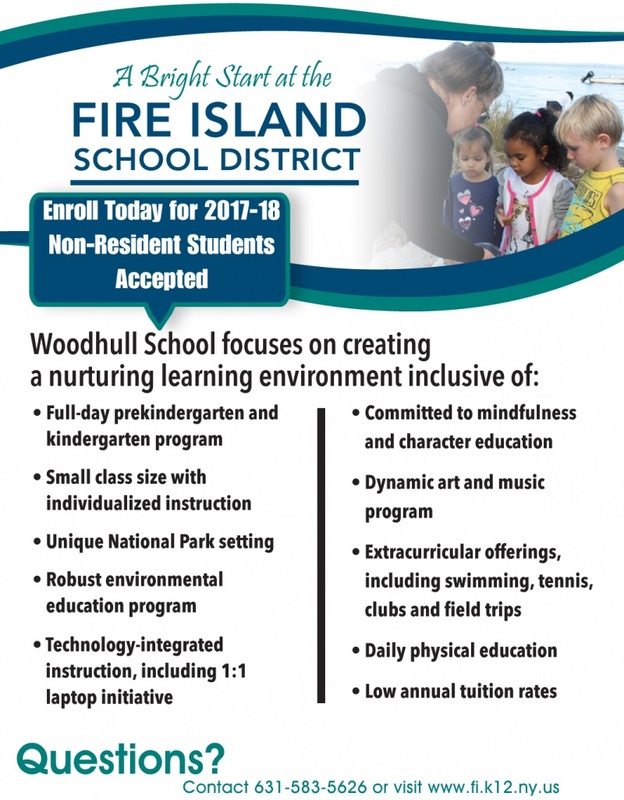 Now accepting non-resident students, Fire Island's Woodhull School (pre-kindergarten through sixth grade) is a gem! Small class sizes, dynamic teachers, natural and technological resources, attention to social and emotional learning, and a supportive community come together to help all students grow and thrive. Located outside Ocean Beach, all transportation occurs by bus, including after-school programs. All students participate in musical groups, daily PE, Spanish, technology instruction, art, and library classes. Call for a bus pickup to visit our vibrant and unique school.